Gone are the days of a website’s reliance on “Contact Us” pages. The archaic reliance on a two-day turnaround for a response from a contact form is becoming unacceptable as consumer expectations grow for on-demand attention. If you’re not ready, willing, and able to provide real-time feedback to customer desires then they will simply leave your website and find one of your competitors. Go back even one or two years and it would’ve been enough to install a live chat widget on your website and respond to customer inquiries within about 24 hours. But not anymore. Live chat widgets have been around for as long as I can remember. But in the recent years, with some smart innovation, they’ve kicked into gear in a big way. Live chat by itself simply won’t cut the mustard. Especially if you are attracting a lot of visitors to your website. Efficiently maintaining an old-school manual live chat widget will drain all of your resources. Instead, to engage with your visitors and meet their growing expectations for on-demand responses, you need a modern messaging software which is custom-built for customer engagement. I’m talking about live chat on steroids. A platform such as Freshchat, for example, is a giant leap forward from legacy live chat software into the world of on-demand, resource-light, automated customer engagement. Effective customer engagement is not just about being available to answer questions. It’s about providing context-driven information if and when a customer needs it and triggering messages based on user behavior. Freshchat helps you achieve this. If you’re not delivering personalized messages to your prospects based on their behavior, then you are falling behind in a BIG way. Freshchat tracks everything a user does on your website from page visits to resource downloads and beyond. But the real power comes from their triggered messaging feature that enables you to engage with website visitors based on their behavior, at the right time, without lifting a finger. The added bonus? The Freshchat chatbot works around the clock, 24 hours a day while you sleep! Have you ever been on a call with a customer service agent when you’ve already been asked 15 questions and then get redirected to another department just to start all over again? It’s frustrating and unacceptable in today’s technology-driven customer environment. 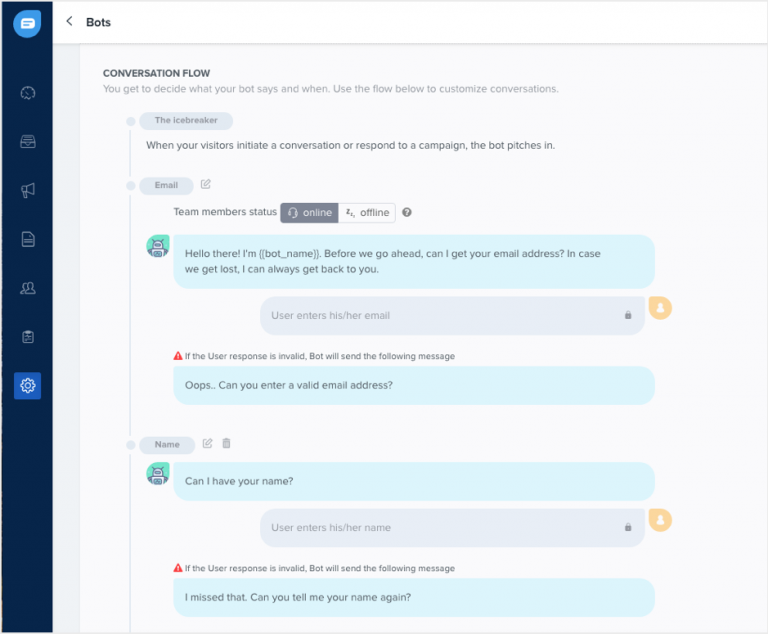 Freshchat automatically assigns conversations to team members based on pre-set conditions such as chat keywords, language, user properties, time of day, and more. Which means customers won’t get sent on a wild goose chase every time they need an answer to a simple question. One of the biggest challenges when it comes to setting up your customer service team for success is the onboarding phase. They’re already used to interacting with customers with an array of other tools. Email, social media, your CRM, and any other engagement platforms you use. Freshchat has a widget that integrates with your team’s current toolset, making the transition seamless. You can also save time by finding and answering the questions that are most important with smart messaging categorization and an inbox prioritized by the due date. As the customer service arm of your business matures, you will likely get many of the same questions over and over again. Freshchat stores all of your Frequently Asked Questions (FAQs) in a database and enables users to find the most relevant FAQs from inside the messenger. This is not only a great experience for your customers because they can get the information they need immediately, but it also helps you save time and the headache of responding to the same questions repeatedly. A critical success factor of customer service in a digital world is personalization at scale. You need to provide your customers the answer they need, in real-time, as quickly as possible. 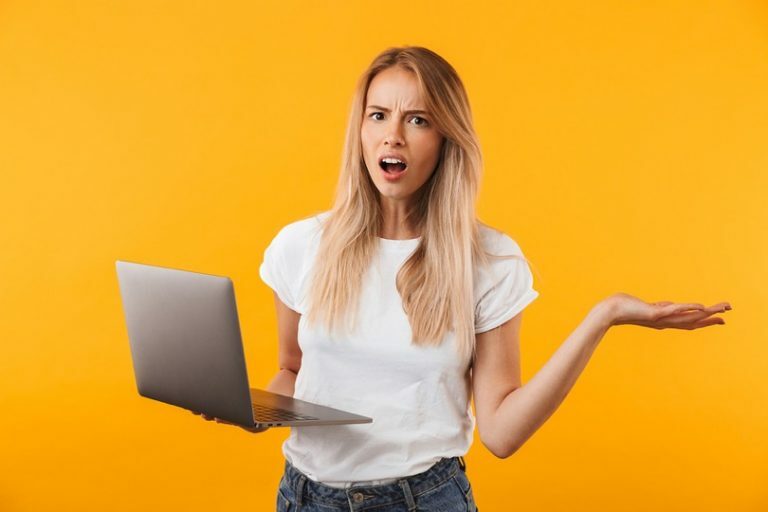 The problem with most live chat tools and customer engagement platforms is that they lack adequate categorization of information, making the automation of responses ineffective. Poor categorization can result in a customer receiving an answer to a question that is totally unrelated to its meaning. Freshchat uses content labels for categorizing all content and ensuring the most relevant answer is presented at the right time. It also brings relevant information from external apps into the customer conversation to help your team provide the insight your customers crave, and groups your contacts based on geography, event history, or product usage. If you don’t measure something, you can’t improve. This is just as important with customer service as it is with any other part of your business. Freshchat provides a visual dashboard of your team’s performance, including; customer satisfaction ratings, response speeds, individual team member performance, and conversation trends. Use these stats to spot gaps in your approach, hold people accountable to business objectives, and ramp up your team’s productivity and effectiveness. True customer engagement happens across multiple channels. From your website to social media, to a mobile phone. Freshchat keeps the customer experience consistent and ongoing even when someone leaves their laptop or pops out of the office, by bringing all of these engagement channels into one inbox. 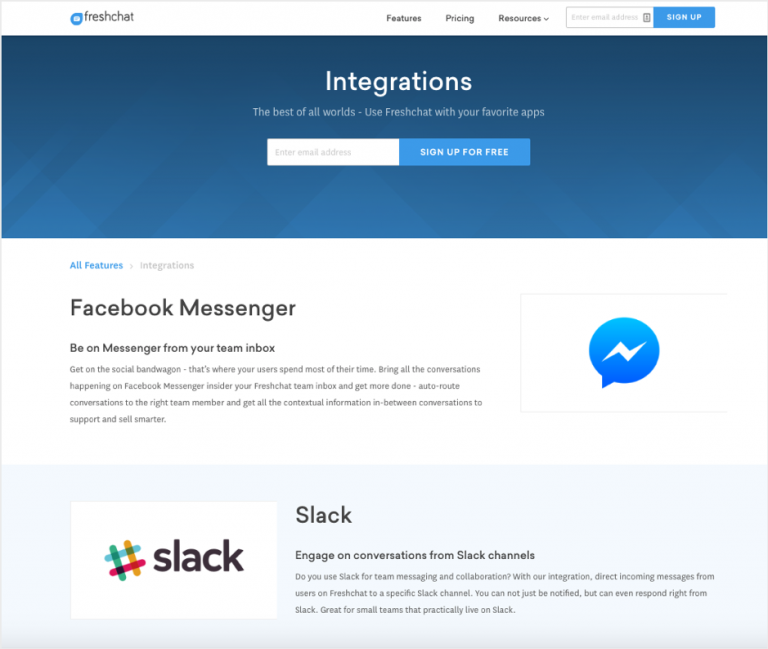 Some of the Freshchat integrations include Slack, Facebook Messenger, ClearBit, and Zendesk. So why is everyone leaving your website? It’s not that you don’t care, but maybe you are just using the wrong engagement techniques. The digital ecosystem has moved beyond contact forms, popups, and one-dimensional live chat widgets. It’s time you upgraded that old Datsun to a Tesla. Freshchat might be exactly what you need to engage your leads and customers at scale. Sign up for a 30-day free trial of Freshchat here. No credit card required. No strings attached.